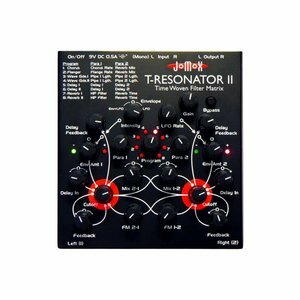 The T-Resonator transforms timely events into an analog feedbacked filter network. 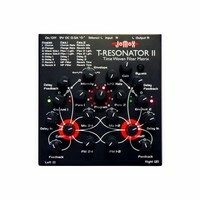 The T-Resonator is something like an M-Resonator + Digital Delay. But you can select 8 different delay algorithms, each with different delays and different feedbacks and modulate them even with an LFO. Delays reach from less than a millisecond to 1 second, range and structure is depending on the algorithm. The delay feedback comes across the analog filters, of course. You can create gaining analog echoes, "klingon parties" by extremely feedbacked wave guide algorithm and much more. By the analog feedback everything sounds organic. The screaming analog feedbacks can delay themselves and thereby form new sound patterns. The sine LFO gets retriggered by the audio signal and can be shaped with the audio envelope or just run alone. In center position the amount is 0, to the left it's envelope-shaped LFO, to the right it's only LFO. The filters are made from discreet parts and form a 24 dB pole lowpass filter transistor cascade. They can - in any thinkable way - be self feedbacked and be coupled or feedbacked with each other, so that extreme sounds and chaotic states create - all what you need today for creative analog sound design. Incredible bass gains or screaming scratch sounds are no problem. The mix pots are zeroed in center position; any other angle will couple or feedback negatively or positively. FM in both directions is also available.